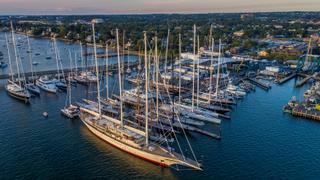 The Candy Store Cup superyacht regatta returned to Newport Shipyard for its second year with three days of highly competitive racing from July 27-29. This year’s regatta attracted a strong fleet of 11 competitors, but as the photo above shows there were also many more notable yachts in attendance, including the 90 metre Royal Huisman flagship Athena. 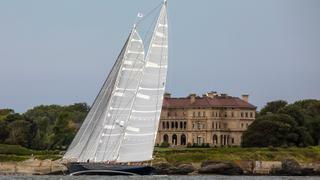 The Candy Store Cup superyacht regatta returned to Newport Shipyard for its second year with three days of highly competitive racing from July 27-29. This year’s regatta attracted a strong fleet of 11 competitors, but as the photo above shows there were also many more notable yachts in attendance, including the 90 metre Royal Huisman flagship Athena. 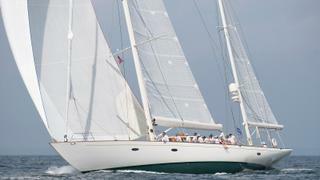 Racing at this year’s Candy Store Cup was split into three categories, with the 37.3 metre Action, the 32.5 metre Sunleigh and the 41.55 metre J class yacht Ranger contesting Class A. 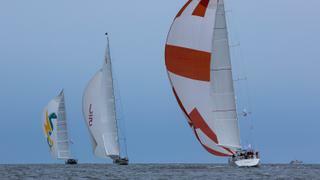 Mother Nature proved to be a key protagonist in the 2017 Candy Store Cup, with changeable conditions across the three days. Mid-range southwesterly winds on Thursday gave way to a light northerly on Friday before the winds really whipped up on Saturday, causing Sunleigh to opt out of racing and forcing three further yachts to retire. The course for the 2017 Candy Store Cup was modified to start off Castle Hill and take in Brenton Point and the Cliff Walk as some of the most scenic backdrops. The photo above shows Meteor passing The Breakers — a turn-of-the-century mansion once owned by the Vanderbuilt family and now designated a National Historic Landmark. The course for the 2017 Candy Store Cup was modified to start off Castle Hill and take in Brenton Point and the Cliff Walk as some of the most scenic backdrops. The photo above shows Meteor passing The Breakers — a turn-of-the-century mansion once owned by the Vanderbuilt family and now designated a National Historic Landmark. 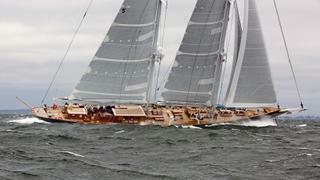 After three days of close racing, two yachts were tied on four points — Action and Bequia. Faced with this dilemma, the organisers opted for the traditional tie-breaker of starting prowess, which handed the win to Bequia.